“Greengrass zones out for this one,” said one clever guy to another. “Greengrass’ Green Zone will make you green,” the man replied. There are a plethora of puns to toss about given Greengrass’ name, the title of his latest being Green Zone and the film causing nausea in more ways than one, but none better than “The grass has been greener”. Take that in anyway you wish — Greengrass has made better films, films with political agendas have been better, war films have been better, for example — because any of those and whatever you can imagine can be applied to this situation. First off, I’d like to say that this film isn’t a complete failure. It’s a lot like Michael Mann’s Public Enemies, as both films are simple and to be taken at nothing more than face value; their importance lay in their simplicity. For some this is a major turn off because if there’s nothing to ponder then there’s nothing to remember; for others this works wonders as it can be refreshing as deconstructive cinema. In neither situation did I find this to be the case and both wound up eliciting the same impression: somewhat enjoyable, moments of great intrigue, amiable protagonists that I enjoyed the company of for a few hours, but when the final credits rolled I was left saying “Alright, so what’s next (for me to watch)?” instead of discussing the philosophy that it preached. Greengrass lays it all out on the table for viewers to interpret in the single-way he wants you to and its this blatant filmmaking that I cannot abide. 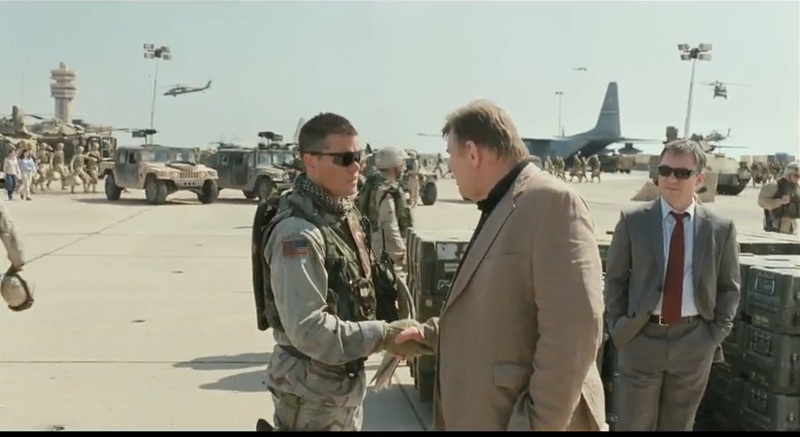 In Green Zone, the opening scene indicates that the film is set in 2003’s Baghdad. Chief Warrant Officer Roy Miller (Matt Damon) is a strong-willed and stubborn man who turns renegade after growing fed up with mission after mission of redundancies and lies. “You have bad intel,” says Miller to head of Special Pentagon Intelligence Clark Poundstond (Greg Kinnear), “the WMDs aren’t there”. Seeing as this is set in 2003 and our lead character a man searching for WMDs, anyone who has given The Daily Show or anything war related a few minutes of their time within the past 6 years knows where this film is headed. This would be perfectly fine if the film was a practice in understanding the who, what, where, when and whys of this war in Iraq, but seeing as how Greengrass takes a more Bourne than United 93 route with this feature, it fails. A thriller where everyone knows the ending does not a good film make. Coupled with the easily interpreted theme are just as easily interpreted characters. Soldiers are neither good nor bad people, they’re merely trying to get by one day at a time; guys with complex names like Poundstone and Al Rawi are villainous by one-dimensional definition while earnest names like Miller, Brown, Dayne and Freddy (the name the Iraqi informant takes on in juxtaposition to his far more foreign sounding one) are the ones we grow to root for. The film does well in making the good guys overly sympathetic — no one knows what’s going on and are trying their hardest to enlighten themselves en route to survival — so in that regard it succeeds, albeit in a manipulative way that becomes palpable. Same applies in making the bad guys villainous — they hold all the cards (a Jack of Clubs pun, by the way), they manipulate everything, they’re not to be trusted, we grow to despise them. From the structure to the dialogue to the conclusion, everything is foreseeable in this feature. This threatens the integrity and truth in this “cinema verite” (true cinema), while simultaneously reassuring the entertainment factor for people hoping for “Bourne Goes to War”. Personally, I’d have preferred a non-mitigated evocation of Greengrass’ petulance over this saturated political diatribe. Bloody Sunday, anybody? Which brings me to my next annoyance: How could Paul Greengrass, only 7 years removed from making a film about political discrepancies like Bloody Sunday, go on to make a film as watered down and flagrant as Green Zone? Now, I’m no great advocate of Bloody Sunday, but Greengrass’ inception into the realm of handheld cinema had the perfect subject for the aesthetic in filming a story that was absolutely dear to his heart. The story and technique worked together in castigating the IRA; the verite in “cinema verite” was undoubtedly present. Sure, Bloody Sunday had its problems and sure it seldom dipped into violence to make its point, but that’s what made it so special; it was tacit in its own way. Green Zone is about American politics and American problems. I’m sure Greengrass has acquainted himself with them quite well in pursuing this feature, but somewhere along his career he’s forgotten how powerful speaking from one’s heart can be and has since resorted to, and I’m quoting many bad action movies at the same time here, let his fists do the talking for him. You don’t need to go very far to achieve resolve in this contrast; it can all begin and end with the photography. In Bloody Sunday, the handheld camera quietly navigated the dilapidated streets of Ireland; you sensed the despair and perhaps even pensive during those long shots. Compare this to Green Zone’s cinematography where the same technique has taken on a different connotation, one which feels more like a round of Gears of War than something trying to be cinematically potent. If you’re looking for a decent way to spend two hours and aren’t one to think about thematic ponderings, then sure, go see this right away. However, if you’re looking for something intelligent and pure like Bloody Sunday, go elsewhere to fill your quota for cinematic honesty.